Who doesn’t need an extra side table added to their home decor? 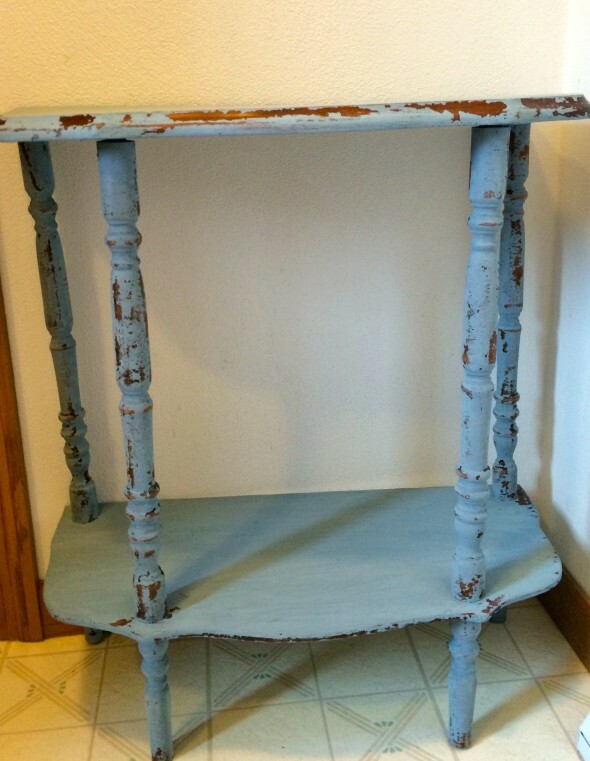 When I came across this lonely little table, I knew I could give it a fresh new look that would be a great home accent next to a reading chair, or as a side table by a bed. I was wanting the chippy-look so I only sanded the two flat surfaces of the board. I then brushed on Miss Mustard Seed Paint in Kitchen Scale to the piece. This color is more of a blue/gray color. After two coats, I could so see the paint starting to chip on the legs and edges of the top. Love it!! I gave it a light sanding to help with the paint to chip and flake off and also to give the flat surfaces a smooth finish. I finished it up with a clear wax and buffed it out. It turned out exactly the way I envisioned it. I just love what paint can do to freshen up a piece. Happy with this transformation! What are you working on? Please share your awesome transformation with me. Let’s inspire each other. What a cute find – I love the table! I love your idea of transforming thrifty finds. I don’t do much decorating cause I have such a hard time parting with my money and it all seems so expensive. Great blog! I love the first table – the color is what got me. I think about doing this stuff all the time, but I don’t have a garage or space where the wind and wet won’t bother it. 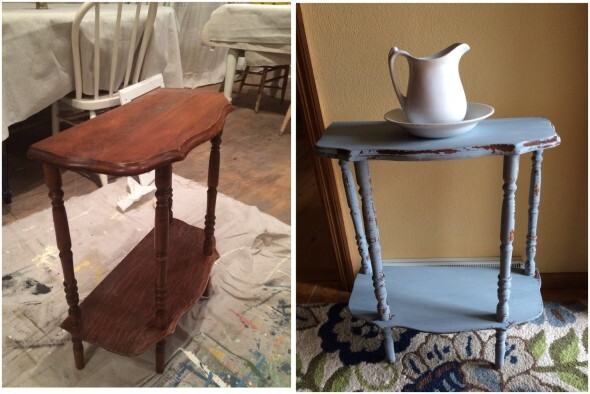 I use milk paint which allows me in winter to paint right in my living room. 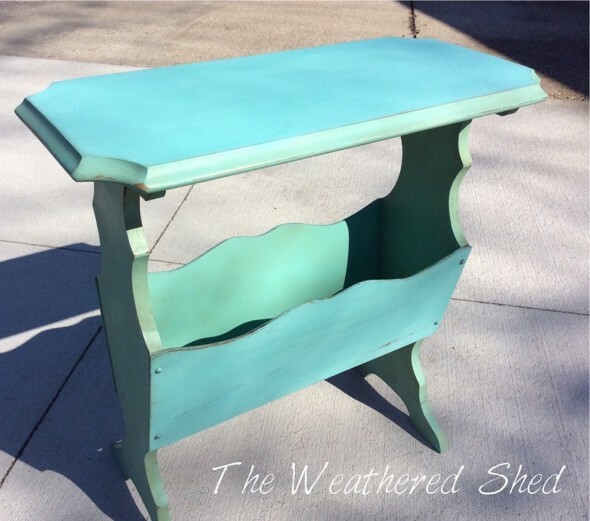 Chalk paint you could do the same. Give it a try, you’ll be hooked! Such a beautiful piece, nice color and finish! A beautiful makeover! Oh my gosh, what a fantastic job you did! I think you should start a YouTube for tutorials! I also have a hard time choosing paint colors, but I love the color you chose and the chippy look you gave it. So pretty!! What a beautiful makeover! Love the color and the finish, such a beautiful piece! Thank you for taking a look. It is always hard to decide on a color. Love it! It looks like it has been that way for ages. And I really like the color. 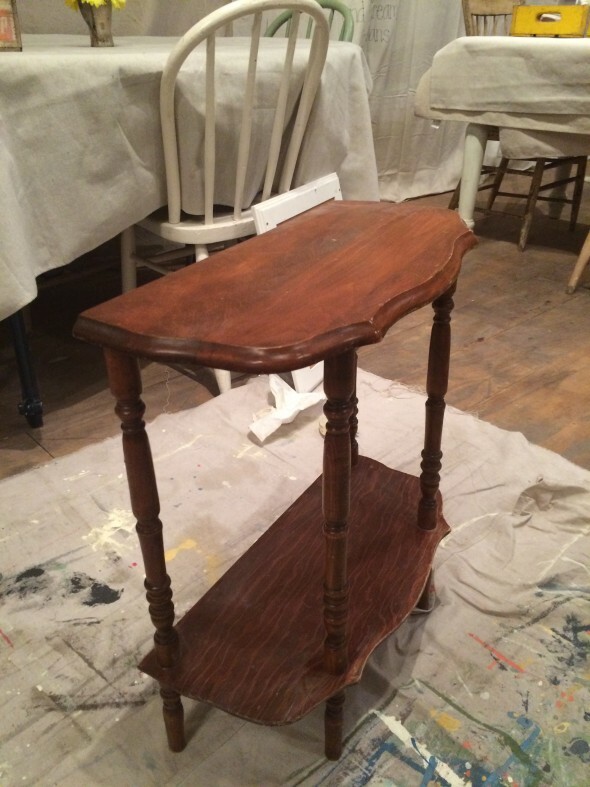 It freshened it up, yet the piece still looks old, a little worn and a lot loved – perfect! I love it! It reminds me of the buffet table my grandmother has. Hers is naturally chippy. I have always wwanted to create a piece like this. Thanks for sharing how you did it. I love the chippy look. But when its for real its the best looking!